Some of you are aware that my husband recently left a pastorate where we had served for 4 years, and it didn’t end well. It was one of the most difficult decisions of our married life, and a very unpopular decision in some ways, yet since then I’ve rested in the peace of knowing we made the right decision. When this first happened, God did some amazing things for us!He provided for us in inexplicable ways – as only God’s people can do as the body of Christ. And when we made the leap to church-planting (who? us?! ), we were filled with encouragement, excited, and rearing to go. But then some disappointments came, and church-planting ended up being a lot more difficult than we imagined. We thought we had a solid plan for how this whole thing was going to work out, but as He so often does, God quickly showed us that our ways are not His ways. Since then we’ve been in a season of waiting. If you follow this blog or Being Confident of This’s facebook page, then you know that discouragement hounded us for a couple of weeks. We were no longer seeing quite as much physical evidence of God’s blessing or direction. And like so many humans, we began to doubt. 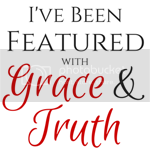 An Israelite at heart, I began to complain to the Lord about our circumstances. Daily bread wasn’t enough for me; I wanted more. Thus, a spirit of discontentment invaded my soul. Wouldn’t you know that during this time, I ran across Christi’s post three separate times?! Three! And even after reading it several times, I found new things to like about it, not just because Christi’s an excellent writer, but because the message of her post is so very true. We hear and read a lot these days about our BIG God who encourages big “dreams” because He’s the God of the impossible. While all of those things are true about our God, He remains true to His character and His Word even in the times when dreams don’t come true, when He doesn’t show off. Please take a few minutes to read Christi’s post. I know you won’t be disappointed! 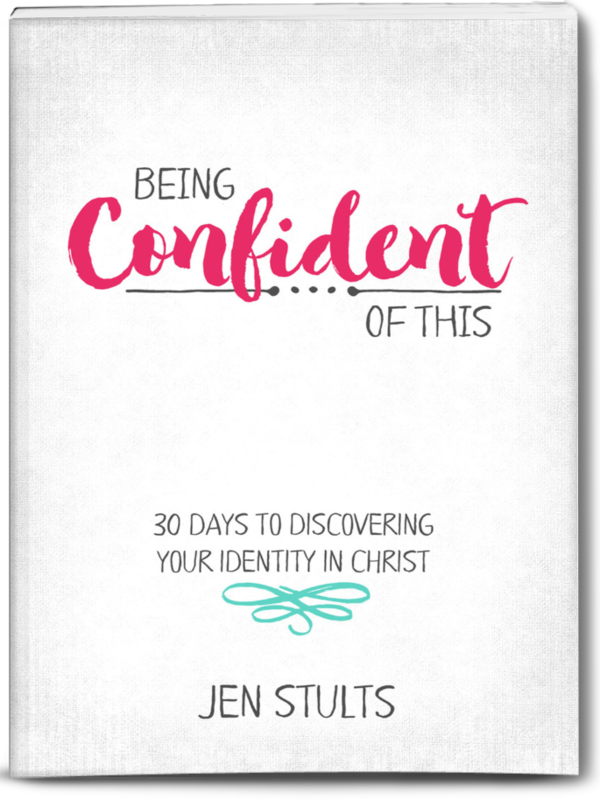 And for those who might be curious, we’re coming out of our little cubby of discouragement and embracing the truth that God IS who He says He is. So, we press on knowing the path He has laid before us and trusting Him to guide us each step of the way. We’d appreciate your prayers for Montpelier Bible Church! Faithful friends and readers, please forgive me for my lateness in posting the link-up! I hope you all find some encouraging truths here this week. It happens every year around this time, when nature eases the northern hemisphere into the Fall season with ever-cooling evenings and misty mornings. When pumpkin-spiced everything invades North America, we can be sure the season is well underway, and along with pumpkin-spice, we’re sure to read an opinion or two about Halloween and Christianity. 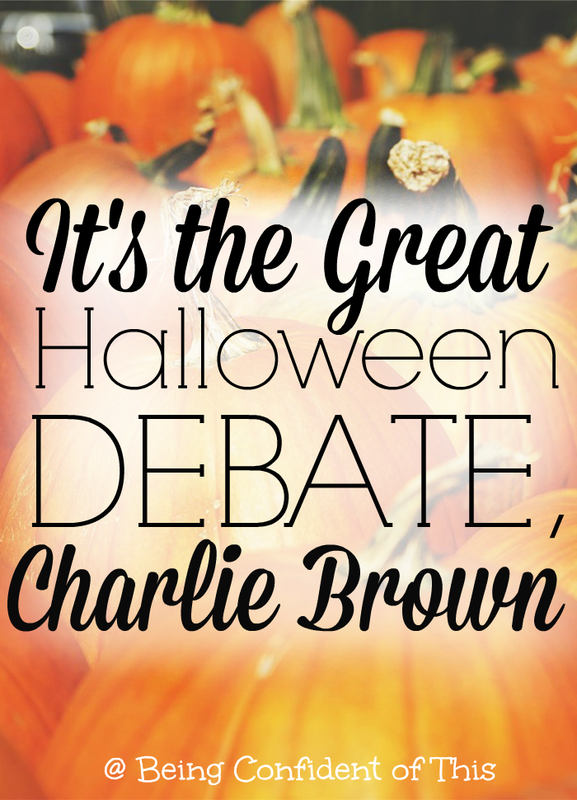 It’s the Great Halloween Debate, Charlie Brown. I’m not sure about you, but the Halloween issue is something I’ve struggled with as a Christ-follower (it’s right up there with what to do with Santa, the Easter Bunny, etc.). What to do with Halloween is one of those be-in-the-world-but-not-of-the-world gray areas that so often divides Christians. Yes, I’ve researched the history of Halloween and Christianity – both the pagan roots of the holiday and it’s Catholic counterpart, All Saint’s Day. I’ve even read a few articles lately about what Christians should or should not do in regards to this day. I’m just not sure I agree that there is one “right” way anymore. The problem with the Great Halloween Debate is that scripture remains unclear on what to do with such holidays. How to celebrate (or not) is of the those “gray areas” where the Christian response is not dictated by scripture alone. Unlike other potential sin issues on which scripture is clear, such as sexual immorality, dishonesty, theft, murder, and so forth, we read very little about what to do with man-made holidays. For this reason, much of what we read on Halloween and Christianity tends to be human opinion rather than scripture-based mandates. We’ll find similar opinionated arguments about whether or not we should celebrate Easter and Christmas, yet somehow Christians have managed to bring Christ to the center in many ways for those holidays in spite of their pagan roots. Is it possible then, that Halloween might be redeemed in the same way? Or are Halloween and Christianity simply incompatible? Although we don’t find the word “Halloween” in scripture, we do find examples of debates over other worldly issues dividing the early church. According to this passage of scripture, those who ate meat that had been sacrificed to idols were neither right nor wrong. It wasn’t better to do one OR the other. How can this be? The morality of the meat debate depended not on the issue itself, but on their own personal convictions. What is sin for some may not be sin for others in such scriptural gray areas. Another example of debate over meat can be found in Romans 14. Once again Paul reminds these early Christians that the matter of whether or not one should eat meat sacrificed to idols is one of personal conviction. Neither the partaker nor the abstainer should despise the other! At first glance, this verse may be taken to speak to the Sabbath and on which day Christians should celebrate it. But according to various Bible commentaries (Matthew Henry, Warren Wiersbe, etc. ), it was more likely a reference to traditional Old Testament celebrations – whether or not to continue celebrating them. According to Paul, “each one should be fully convinced in his own mind.” It’s up to us as individuals, gifted with the power of the Holy Spirit, to decide about Halloween and Christianity, for ourselves. 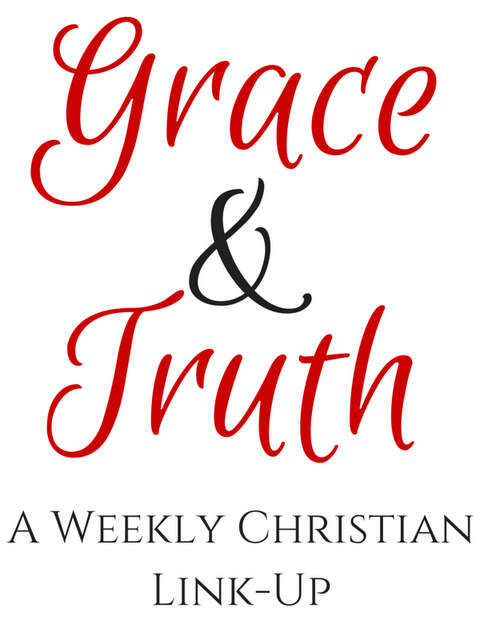 We so often look to other Christians for opinions on such gray areas, or we judge fellow believers as right or wrong based not on scripture, but on our own personal convictions. We are guilty of looking to others for how to walk out our faith here on Earth when we should be looking to the Lord alone. Let the Lord tell you what to do! I’ve come to the conclusion that I can’t tell you what to do about The Great Halloween Debate. When it comes to Halloween and Christianity, each person must come to on his or her own personal conviction. If your personal convictions allow you the freedom to celebrate it as “unto the Lord,” then by all means, do so! If your personal convictions require you to abstain from the “holiday,” then by all means, do so! And if you, like me, lie somewhere in between on the Great Halloween Debate, then let it be “as unto the Lord,” as well. Maybe, just maybe, making the right choice for Halloween is not so much about the details of how we celebrate (or don’t celebrate) but the why behind it. And any day with Jesus as the focus is a good day, in my opinion, whether we partake or abstain. Perhaps the best way to overcome evil, to be a light in the darkness, is to quit biting and devouring one another and focus on loving each other instead. Let’s not be like Sally in It’s a Great Pumpkin, Charlie Brown. She worried over whom to believe – Linus or her other friends. Rather than forming her own convictions, Sally allowed herself to be swayed by others throughout the night, leading to a lot of unnecessary worry and eventual frustration. Let’s drop the Great Halloween Debate, shall we? Instead, let’s just follow hard after Christ and quit worrying about what others are doing (or not doing). Some say it is our deepest human need: to feel loved and accepted. This deep need for love – it’s why we were designed for community, granted the ability to build relationships with others. 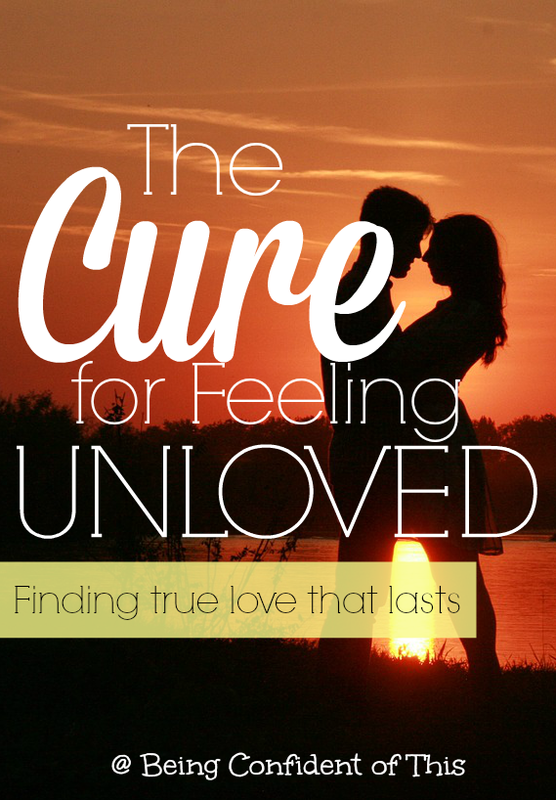 Yet many men and women alike walk through this life feeling unloved and unaccepted. I know this to be true because every month hundreds of you come here to this space searching one word. The problem is that we are imperfect people living in an imperfect world; thus finding true love that lasts a lifetime seems nearly impossible. True love often escapes us no matter how diligently we search for it, and thus, we end up feeling unloved and alone. Perhaps we’re looking in the wrong places? We believe if we find “The One,” then we’ll never feel unloved again. But even those who are happily married can sometimes feel unloved; it’s true. Is love that lasts impossible to find then? Don’t give up just yet, friends because I’ve got good news for all of us today: there is such a person! One who not only was willing but who actually suffered and died in our place also – that’s how fiercely He loves. The cure for feeling unloved lies only in one person, and His name is Jesus. If you need help finding true love, then He is the answer! Maybe that sounds too easy for you, too simple or too trite. Maybe you struggle to believe He is real, or that He could ever love someone like you. Maybe others have hurt you, let you down in life and you’re not even sure if you believe in true love anymore anyways. Before you laugh me off or click away in frustration, please hear me out. The world is not kind to those who wish to find true love. No, the world – fallen men and women – seek love for themselves first and foremost. We find love hard to come by, and thus, hard to give. We’re so true-love deprived that we fear we can’t afford to just give our own love away. But we don’t have to stay stuck that way, friends. We don’t! The key to finding true love can only be found in the person of Jesus. Listen to the lengths He has gone in order to prove His love is true. This is True Love, friends, the kind that sacrifices all for the sake of another, even if that person never returns the love He gives. That’s pure love like we’ve never seen before and will never see again. The key to finding true love is in a personal relationship with Jesus. A personal relationship with Jesus begins with an understanding of your personal sin and how that separates you from the love of God. As much as we hate to admit it, we are all broken. We’ve run away from our Creator God’s original design for us, and this has left us unable to be good and acceptable and whole on our own. You don’t believe me? You think mankind is naturally good? Then why are you here searching for the key to finding true love? It should be easy to find if that were the case. If mankind were intrinsically good, then we would not feel so unloved. A quick glance around our world and all of its pain tells us that mankind isn’t naturally good. And if you’re honest with yourself, you can admit that you have to work at being good, just as I do. Being good doesn’t come easily or naturally. That fact doesn’t negate the beauty of the human experience, though. In fact, our Creator God values us so much, in spite of our flawed nature, that He sent His only Son to die in our place, bearing our shame and punishment. That death was and is ours to pay, friends! The wages of sin, death, is what we have earned by our own choices in life to walk away from God’s plan in favor of our own plan. 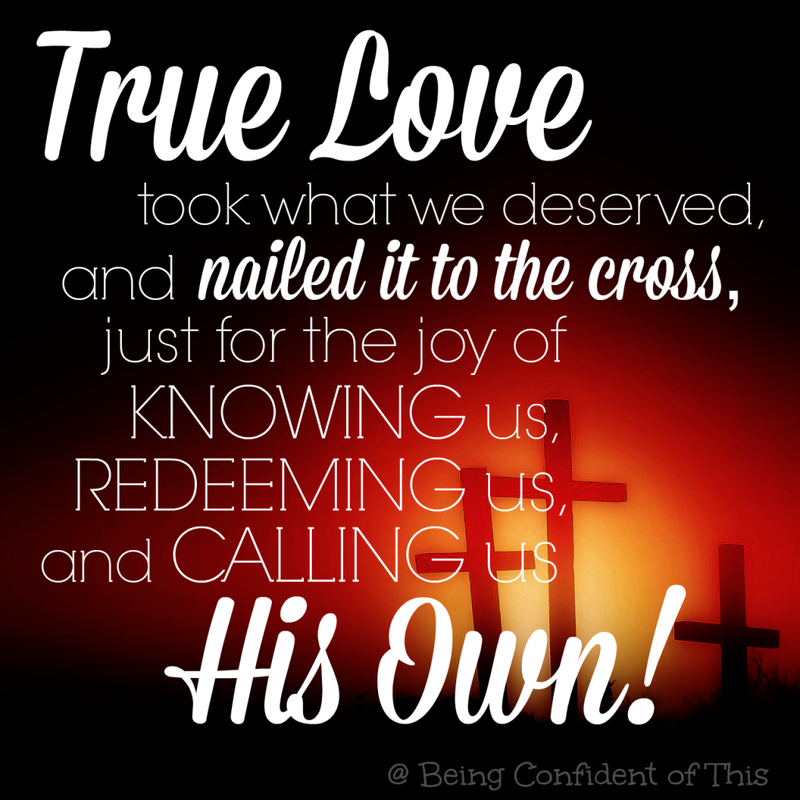 The good news is that True Love took what we deserved and nailed it to the cross, just for the joy of knowing us, redeeming us, and calling us His own! Who wouldn’t want that kind of sacrificial love in their life? Because of Jesus’s death on the cross in your place, you can have that personal relationship with Him. It is a free gift, ready for the taking. Believe that True Love is real, that True Love died in your place out of love for you. Believe that the free gift of salvation is yours for the taking. Choose True Love and you won’t have to go through this life feeling unloved for another second. 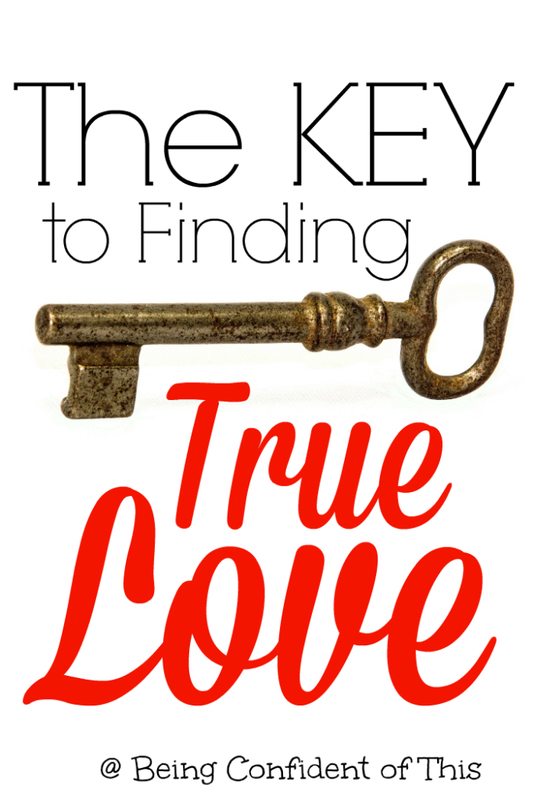 The key to finding true love, the kind that lasts for a lifetime? You won’t find it in a woman or a man. It’s only found in Jesus. Another week has gone by already, time slipping through our fingers without catching our notice. What are we doing with our time? And what are we doing with our privilege? Kelsey from The Unabashed Life asks this question. Her thought-provoking post made me simultaneously thankful and ashamed: thankful for the gift of privilege and ashamed for not always being a good steward of that privilege. Thank you, Kelsey, for the timely reminder that to whom much is given, much will be required. May we seek His face even more diligently! One of our greatest privileges is the knowledge of the gospel, friends. And lately my heart is so burdened for the lost and the wounded – those around the world who have never heard the name of Jesus and those right down my street who aren’t in relationship with Him either. Let’s spread our treasure around, friends. That’s what we’re meant to do with it, after all. Let’s remember those brothers and sisters in Christ who are suffering in ways we cannot even imagine, too. 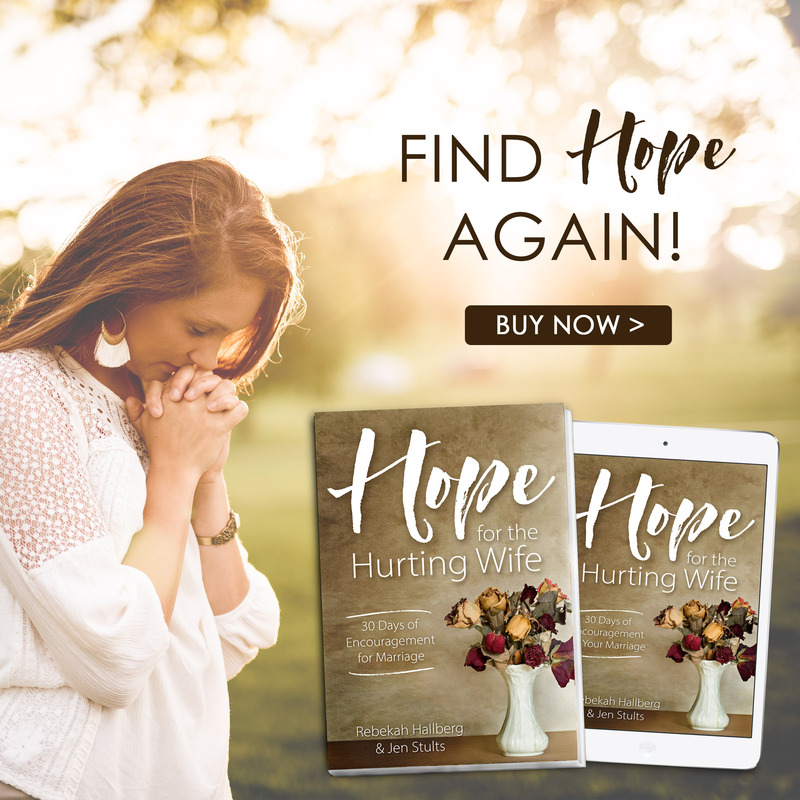 Above all, let’s cling to Hope and quit striving in our own strength.